To pursue yesterday's line of thought about the importance of chamber opera companies on the New York opera scene, much credit must be given to coópera: POM as in "Project Opera of Manhattan" (or, as the case may be, "Pom Wonderful"). Last weekend's production of the 1973 one-act version of Candide, credited to Harold Prince, was wildly entertaining, cast with uniformly talented young professionals and supported by a fine orchestra conducted with panache by the equally talented Jorge Parodi. Discussions of whether Candide is an opera or musical theatre are pointless. According to Anthony Tommasini's criteria, it is both an opera because it is musically-driven and it is musical theatre because it is dialogue driven. One might consider the music to be one of Leonard Bernstein's finest creations while the lyics by Richard Wilbur are extraordinarily witty and clever. I suspect that much or perhaps most of the wit was provided as "additional lyrics by Stephen Sondheim and John La Touche". The Sondheim contribution is most evident. The story is loosely based on Voltaire's "Candide". The master himself was played by John Martello who stepped easily into the role of Dr. Pangloss. Evan McCormack has a meltingly beautiful tenor and played the title role to innocent benighted perfection. Soprano Rosa Betancourt certainly has the high notes and portrayed Cunegonde most winningly. Their duet about marriage was charming. Sophia Benedetti was a very frisky Paquette while velvet-voiced Jorell Williams had a great deal of fun portraying the vain self-involved Maximilian. Laura Virella (cofounder and artistic director of the company) used her rich mezzo to great advantage in the hilarious role of "The Old Lady" who gets by with one buttock. The audience went wild for her big aria "I Am Easily Assimilated". 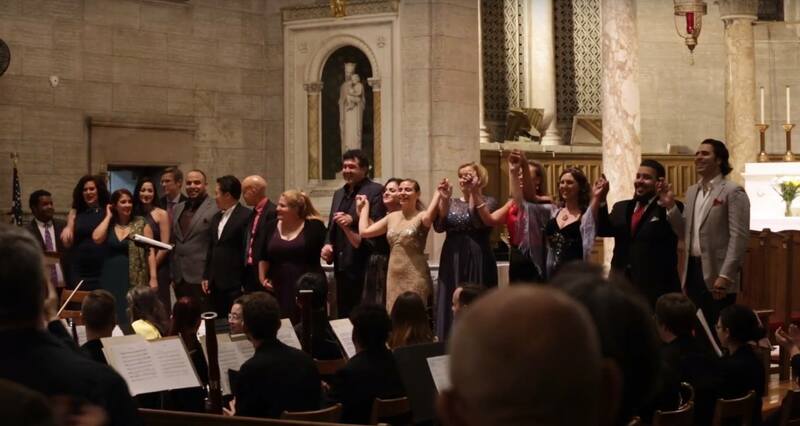 The final choral number integrated their voices with those of Aaron Mor, Scott Power Elliot, Dorian Balis, Gregory M. Spock, Gerad O'Shea, Tricia Ostermann, Meagan Amelia Brus, Monica Hershenson Thuris and Christine Price who all had assumed various roles in the production. There wasn't a single disappointing voice in the cast. 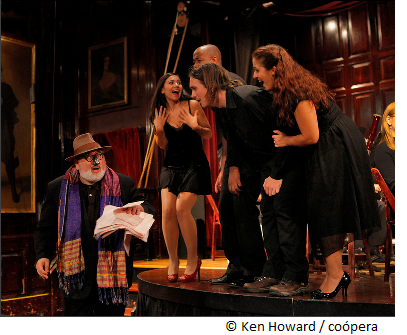 coópera has a mutually beneficial relationship with the Players Club, a lovely venue for chamber opera with a large flexible room that permits a variety of seating and staging options. In this case the stage was a slightly raised platform in front of the 13-member orchestra. There were only minimal costumes and virtually no scenery to compete with the music and acting and one quickly forgot about the lack. The New York City Opera presented the work in 2005 and 2008 and I distinctly recall the cast comprising both Broadway people and opera people. Sadly, it was amplified. Yes, the sets and costumes were lavish but I prefer the intimate production I just saw. 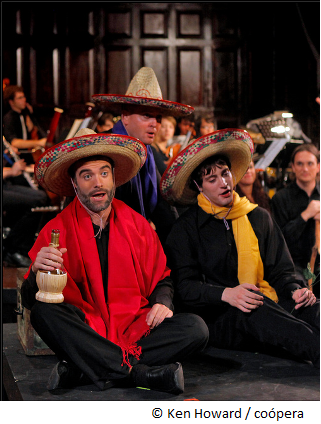 Never mind that NYCO called itself "the people's opera". I would say that coópera is REALLY opera for the people! Candide, illegitimate nephew of the Baron of Something Unpronounceable, has been raised and educated with the Baron's children, the most privileged children in the land. He and his lovely young cousin Cunegonde fall madly in love with one another, which causes Candide's expulsion from the family because of his low birth. The family that kicked him out are themselves either killed or kidnapped by raiding militia, and Candide and Cunegonde both face a series of trials and misadventures (including being reunited and separated again at least, oh, forty times) that test their faith in the optimistic worldview they've been taught. In the end, when he is reunited for the last time with Cunegonde, Candide adopts a more mature worldview ("Make our garden grow") not unlike the guidance Garrison Keiller gives to his radio listeners: "Be well, do good work, and keep in touch!" I haven't a single complaint about the singers. Candide himself was sung and acted by Evan McCormack. Young Mr. McCormack has the wan, naive look of an innocent and a light, lyric sound. Poor young Candide endures many trials and struggles to understand the world, and we saw the lad's incomprehension and innocence clearly. We knew that, even though he adopts a more mature outlook, he will surely relapse into optimism from time to time. Cunegonde was beautifully sung by Rosa Betancourt, a lovely young soprano with lots of -inas and -ettas in her credits. "Glitter and be gay", Cunegonde's showpiece aria, was cleverly staged, as Cunegonde grows tipsy sipping champagne and toying with the jewels in her box. I have to wonder whether overdoing the drunk shtick impaired some of the more taxing moments in the aria, however. As the Old Woman, mezzo Laura Virella was the greatest standout of this show for me. She gave us singing that was beautiful and acting that was just histrionic enough. Her comic timing was the best of the evening. The Old Woman must be a tremendously rewarding character to play. The YouTube clips one finds of "Easily Assimilated", the Old Woman's song, often show veterans of musical theater or opera having a wonderful time hamming it up. It was clear Miss Virella was having tremendous fun. I cannot omit the singing and acting of Sophia Benedetti as Paquette, the (tramp) flamboyant servant girl of the Baron, or Jorell Williams, the flamboyant son of the Baron. Both were a delight to see and hear. I think the straight men, if such an animal exists in an opera audience, must have especially enjoyed Ms. Benedetti's performance as Paquette. The entire ensemble was comprised of fine young singers, most of whom assumed several characters during the course of the evening. 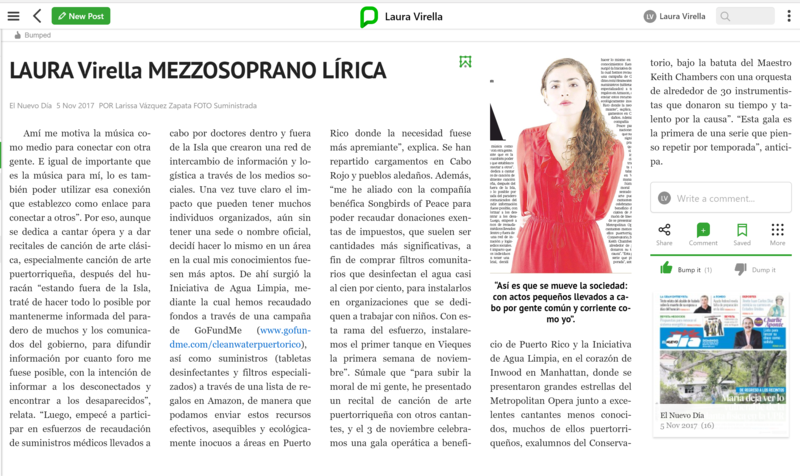 I hope to see more productions by coópera: POM, and more from these young singers.